For making small, highly-detailed vacuum formed components, this desktop machine can't be beat. The all-in-one design includes an overhead heater for softening the plastic sheet, a clever lever-operated transport frame that lowers the plastic sheet over the pattern, and a base unit containing an extra-strong-vacuum chamber to draw the plastic tightly over the pattern. Use it to make airplane canopies, tire molds, rock and retaining wall molds, dollhouse decorations, model junkyard debris, railroad flat car loads, hopper car loads, coal piles, wall and roof panels, and so much more. Industrial-quality machine is capable of making thousands of moldings. Works with clear, white, black, tinted or opaque plastic sheets up to .040 inch thick. Includes steel beads that support patterns with irregular bottom surfaces. 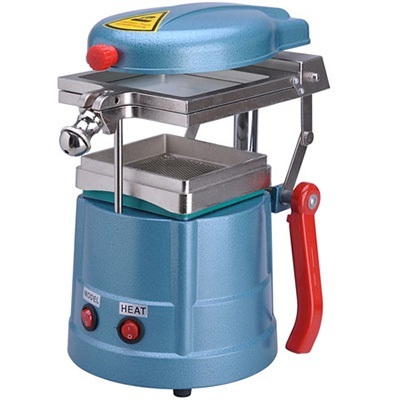 Copy this Compact Vacuum Forming Machine to your MY ACCESSORIES roster.